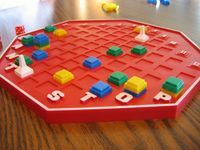 Of course there are square and rectangle game boards and an occasional circle board out there but are there any other shapes? Any examples you can give? 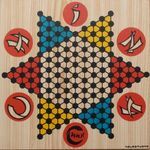 The Samurai board is shaped like Japan. Since it takes place in Japan, you know. Luna has a great setup. Seems more of a game tracker though. Catan has a hexagon shaped board. I played a game that was make from giant jigsaw pieces. Warhammer Quest (and Dungeonbowl, Blood Bowl using the same tiles) used a variety of tiles to create different dungeon layouts of all shapes and sizes. Have to second this one. 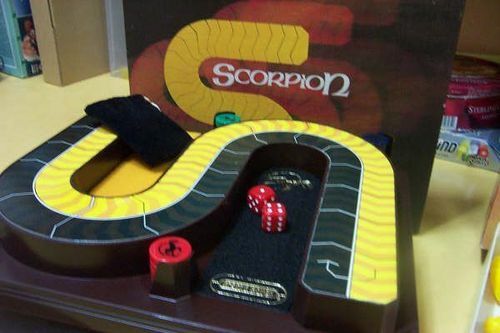 I picked up a copy in a thrift store without having a clue about the game, simply because it was a UK vintage game (and I have a soft spot for things from that simpler time) and, was quite surprised when I opened the box.. Not that I exactly knew what to expect. I would put forward Hive, Logan Stones, and Mijnlieff. 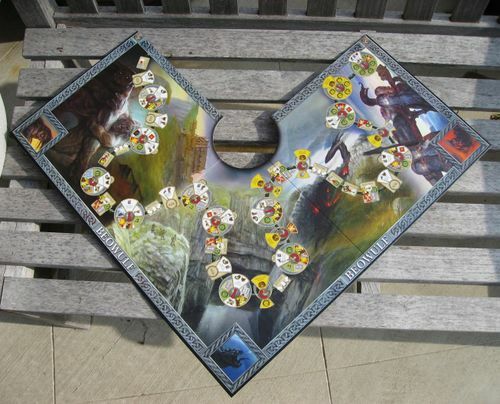 The former two in fairness owe their odd shape to having no board to speak of, so the play area becomes the board, and gets filled with hexagons as play progresses. 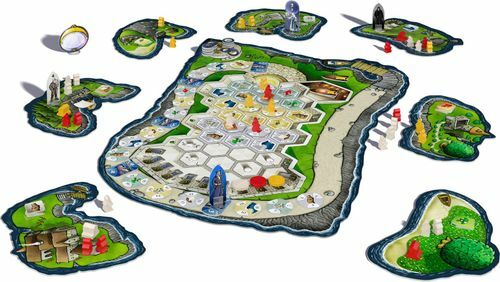 The latter however has a board that is set-up by the players at the beginning of the game from four identical pieces as they see fit. So all kinds of odd configurations are possible. EDIT: Made the post make (more) sense. Wow! Lots of cool looking games up there. Thanks for the responses!! Descent: Journeys in the Dark? 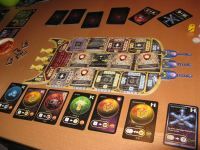 Lots of games have boards to help with the layout, but are not strictly necessary. Such as Suburbia which uses triangular pieces that could fit together into a rectangle but don't absolutely have to. Pretty much anything delivered by Royal Mail, these days, is at risk of being an odd shaped board. I swear the last guy tried to "three-point" my parcel from his van to my door. I was also amazed to discover I'd signed for it... whilst at work.